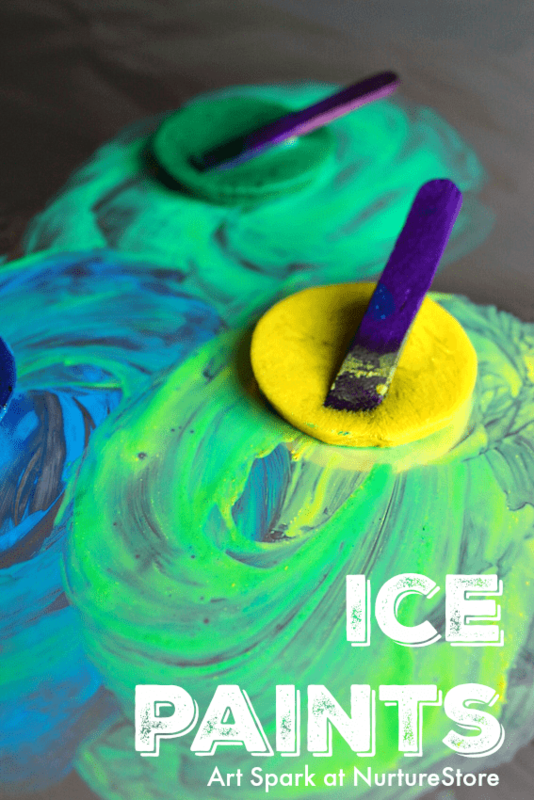 All of the projects in the Art Spark resources are a brilliant combination of art and sensory exploration, and with our ice painting we are using our senses of sight and touch. Your materials will need time to freeze, so it’s a good idea to start this project off the night before you want to make your art. 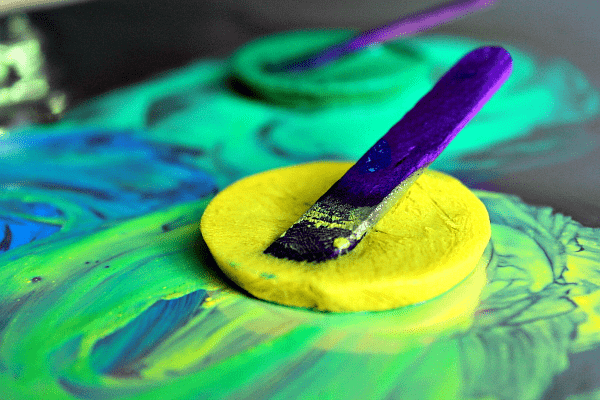 Mix some food coloring, liquid watercolors or water-based paints with water, and then use the colored water to fill ice cube trays or small plastic containers. Place these containers in the freezer overnight or until the water turns to ice. You can place a craft stick in each section of water, to freeze them in place and give you a handle for each ice block. If you have cold outdoor temperatures over winter you could harness the power of nature, setting your colored water outdoors overnight to freeze. 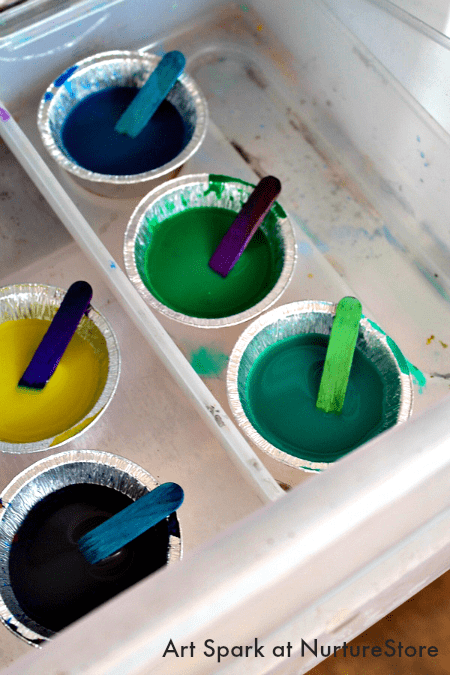 Release your frozen paint blocks and use them to paint with. Running the ice cube trays under cold water for a few seconds can help the blocks to pop out of the containers. 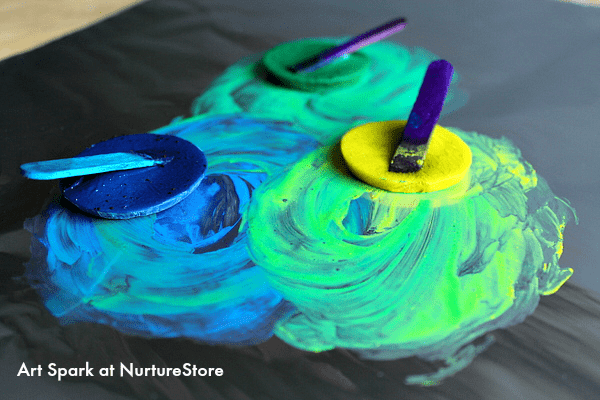 Enjoy the process of painting with the blocks and explore how you can create colors and patterns as the blocks melt. You can speed up the process by filling pipettes with warm water and using them to squeeze the water onto your ice blocks. The ice paints work really well on kitchen foil, as the melting paint blocks feel satisfyingly slippy and slidey as they melt. 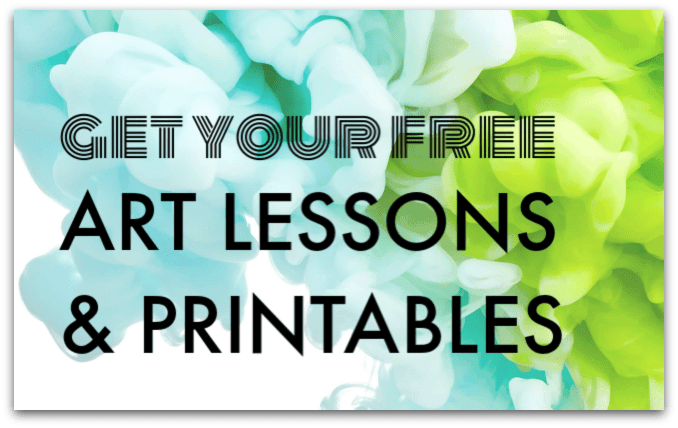 All the projects in the Art Spark ebook and online art course come with suggested variations. This makes it easy for you to adapt the projects to suit your children’s interests. You can vary the projects to suit the ages of your children, and dive deeper into techniques that they especially enjoy. 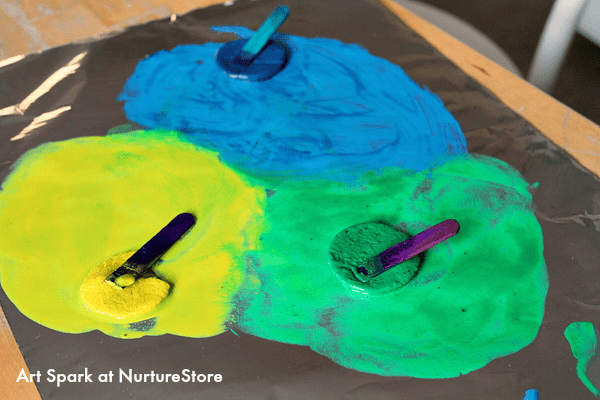 You can use this idea of frozen paint to explore color mixing. Make blue, red, and yellow ice cubes, and observe which colors are created as they melt and mingle. Or try creating ice sculptures. Freeze larger blocks of colored ice and use them to build upwards, creating tall structures. Use a paint brush dipped in water as a ‘glue’ to help stick your blocks together. You’ll also find that many of the Art Spark projects have links across the curriculum, particularly to science and math. For this ice painting exploration you can add salt into the process to include more scientific cross-over. Apply salt to the ice and observe how this affects the melting process. 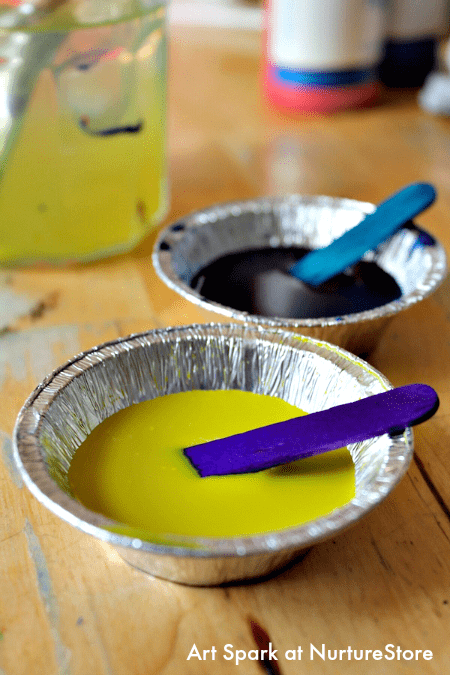 As an extension you can dye salt by squeezing in a little paint. Mix thoroughly to disperse the paint through the salt and leave over night to dry. Then use your colored salt with clear ice blocks to create beautiful designs. Urey COOlL idea, thanks for sharing.